● The on/off switching regime: For example, in a “pulsed” NFT system, the nutrient pump may need to deliver 10-20 feeds per hour. Run-to-waste systems however, typically require only 1-6 feeds per day, each of around 1-2 minutes duration. Refer to our Feed Frequency & Volume Guide for advice on this point. ● The number of devices being switched and the total start-up current. 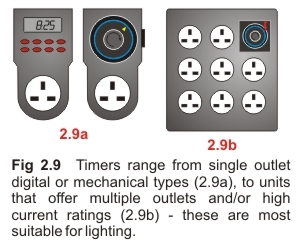 Note, unless relay switching is used, high current devices such as lights will require a timer that is capable of handling higher current loads. ● For safety ensure the power cord is earthed or grounded. ● Durable casing that resists corrosion and ingress of moisture. Click here for information on electricity and safety.